The finest Australian malted barley and hops are brewed together with the purest water and other quality ingredients, giving it a fruity aroma and smooth hop character. Every drop of XXXX Summer Bright Lager receives superior bright filtration, making a beer that’s full-flavoured and free from artificial additives and preservatives. Light and refreshing with a super clean taste - perfect for a sunny day. Also very little bloating due to the low carb content. 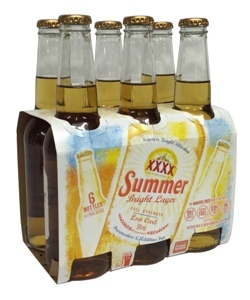 This was my favorite beer whilst living in oz. just so happy I can get it in the uk. I fell in love with this beer whilst living in oz for a year. Now my sister has just got me some for my birthday. I'm now in love with this website. Super light lager with almost no carbs but still full strength! A perfect beverage on a summers day.